Welcome everybody and thanks to Gediminas Urbonas and Ute Meta Bauer for inviting me here and for giving me the opportunity to share with you some simple but urgent issues! I have to confess that I am very excited that I have to present the Disobedience project exactly at such an important moment of worldwide mobilization. I left Italy 3 days ago, the morning after the huge manifestation in Rome with more than 300 000 participants and at my arrival here I have encountered the Occupy Boston camp in front of the Federal Bank building. I have brought with me these 2 newspapers (one of the right wing with the main headlines – “More than Indignados – They are Criminals”, and the other of the left wing saying- “Human Capital” – two opposite definitions of the same event) and I found here this local newspaper – The Phoenix Boston. So we are facing two events and at the same time dealing with the representation of these events. But I will talk about this later on. When Nomeda and Gediminas Urbonas have invited me to work on the Disobedience project for MIT a year ago none of us could imagine that something like this would have happened. During just one year we have seen the Tahir insurrection and the Arab Spring, Indignados movement in Spain, riots in London and UK and Occupy Wall Street and Occupy Boston movements here in America. But I think there are many reasons to connect this new idea of political intervention with the project Disobedience that I have started in 2004. Now in almost every newspaper you can find sentences like the one I found in Boston Phoenix weekly some days ago, which affirms: “It is safe to say that politics as practiced by Occupy wall Street ad Occupy Boston is not a type with which the respective city halls are familiar. This is not politics as practiced by college democrats or young republicans, it is direct street theatre – a form of consciousness raising”. So it is exactly these issues – the elaboration of a post-political thought and action that are at the core of the whole Disobedience project. And it is right in this field of political intervention or collective actions where you can find the merge of social intervention with artistic imagination and practice. So I think that it is more than inevitable today, more than ever before, to speak about Disobedience. And I would like to use this word starting precisely from here, from Massachusetts, because as everyone knows Henry David Thoreau in Concord was one of the pioneers who have introduced this new political dimension. If we want to start speaking of the Disobedience Archive there are many topics that we need to face. In fact, Disobedience is an ongoing archive and an itinerant exhibition at the same time. It is designed as a long-term work-in-progress and is presented as non-comprehensive and provisional, intended to expand over time. It’s a video station about the relationship between artistic practice and civil and social disobedience. Starting from 2004, the project wanted to be a guide to geography of recent protests, from the social struggles in Italy in 1977 to anti-globalization actions before and after Seattle. In particular, Disobedience is an investigation into the practices of art activism emerging from the fall of the Soviet block and the events of the 9/11and those that today are developing on a global scale. Especially today, when in response to the financial crisis and the public debt, we can observe that new forms of confrontation between the civil society and economic power of violent capitalism are emerging on a global scale. So we have to affirm that a new and different kind of political and artistic collaboration characterizes the current phase of the so called post-Fordism or to put it in other words in this post-political phase. With regard to the relationship between art and politics, a radical shift away from modernism is evident; the forms of art activism are determined by a common recognition that traditional democratic politics is largely bankrupt. Although, the fact that protests and events that have taken place during the last year and the last few days may seem apparently “traditional” protests, we must keep in mind that contemporary dissent manifests itself less as theoretical criticism or protest than as defection, exodus and exit. Abandonment rather than confrontation, the search for new participatory spaces, constituent practices, micro-actions on a local scale, forms of self-organization and empowerment were the main strategies of the movements active during the last decade and they seems to be remained such also today. For this reason Disobedience Archive wants to be an atlas of the plurality of resistance tactics such as direct action, counter information, parallel planning process, self-managed architecture, media activism and other tactical strategies. But I would prefer to start with a short introduction of the platform that Disobedience aims to become. First of all we have to try to answer to three main questions that can synthesize the idea of what disobedience is. 1) WHAT DOES DISOBEDIENCE MEAN TODAY? 2) WHAT DOES DISOBEDIENCE CONTAIN? 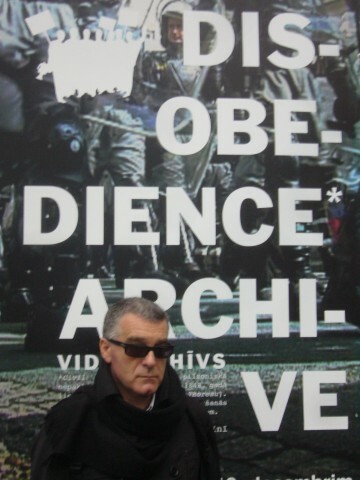 3) WHY IS DISOBEDIENCE AN ARCHIVE? Why put dissent on display? Can art become a practice capable of disrupting the neo-liberalist alliance between the flows of cultural production and the processes of capitalist valorization? In what terms is an “activist” approach to art possible? The recent widespread emergence of political exhibitions on a global scale might lead us to ask what might be the meaning of showing social claims in the context of art, not just as the result of an action, but as an action in itself. Or instead, aren’t we rather dealing with the emergence of something else? Of a space for experimentation with practices and languages shared by art and politics, yet hardly traceable within the genealogy of Modernity? What kind of discourse could issue from this mise-èn-scene of social criticism, civil disobedience and protest? Could the space of art be used as a ground for political debate and confrontation, or must it still be conceived as a space of “disengaged” time, and for this reason, removed from the relations produced by the global market? And then, what conditions must be in place to sustain a politicized exhibition practice, now that we have determined that in the era of “cognitive capitalism,” the art exhibition creates a privileged space for semiotic production? I start from the assumption, that the hybridization of art and politics is the new paradigm for the turn of the millennium. Yet the actual artistic and curatorial production within such a paradigm, which is at the core of a theoretical debate that records the priority of an ethical-aesthetic dimension over a hypothesis of political reconstruction (as is expressed in the works of Guattari, Rancière, Virno, Lazzarato), is rarely investigated. However, the role played by the typology of exhibition space is not at all marginal or minor in relation to its ability to question existing models and thereby develop new spaces for dialogue, production and reception, viewer interaction and political protest. If we try to identify a trend in the priorities of the new aesthetic paradigm of the last decade, activist art—pushed on by the counter-hegemonic WTO protests in 1999 in Seattle or even by the 1994 Zapatist upheaval—would be it. In such movements, in which cultural production is identified with political practice and creative experimentation with media, the emphasis on the individual and the group as devices of resistance and the demand for “autonomous” spaces devoted to knowledge and action have led to a fast assimilation of politics in the fields of contemporary aesthetic and artistic debate. This proposes a structural relation between art and activism. The relation is not just an “alliance” between activist claims and artistic practices, because such a term indicates a common pact in view of common goals. Rather, the connection is to be found at the origins, starting from a common ground, a shared base, a blurred space that prevents one from tracing clear borders between forces and signs, languages and labor, intellectual production and political action. When, as Hannah Arendt says, the word “disobedience” appears for the first time in the political vocabulary, it reduces its essence to a particular case of the more general field of moral philosophy. “Disobedience” turns into “civil disobedience”, and the general “refuse to obey” turns into “refuse to obey the law”, that is, the failed observance of rules on principle. It is Henry D. Thoreau who brings back the dilemma to obey/not to obey on a par with constitutional principles, when in 1846, here, in Concord he refuses to pay the electoral tax to a government – an American government – that acknowledged slavery. This movement from disobedience to a plan for legal order with Thoreau becomes not only possible, though his gesture could appear to be situated on the level of individual morality, but even capable of inscribing civil disobedience inside a tradition of a liberal mould that will find its climax in 1968, when protest against any authority becomes a mass phenomenon. Hannah Arendt’s essay Civil Disobedience (1970) and the book A Theory of Justice by John Rawls as well as the debate in Eindhoven in 1971 between Noam Chomsky and Michel Foucault mark some of the culminating moments of a theorization of civil disobedience, for which the background is no more the Mexican war, as in the case of Thoreau, but the ten-year-long Vietnam war. The problem of the moral obligation to obey the law lies in the center of these contributions of political philosophy. The introduction of civil disobedience into political institutions and the “disagreement as right” represent the aim of the research for constitutionalization pursued by Hannah Arendt. “If, as most think, civil disobedience exists and is not intended to disappear” Arendt writes, “the problem of its agreement with the law is essential and the answer that will be given could be critical for the survival of liberal institutions, that will have to show a great elasticity if they want to stand the changes impact without making civil war’s and revolution’s way ”. Civil disobedience would take a close-up role in a relationship of precarious and increasingly rapid equilibrium among factors of stabilization and factors of change in the legal order, with a constant legality reinstatement and a normative deficit compensation. It is no accident that for J. Rawls civil disobedience is an act no more than, and only, compatible with legal order. In Rawls it turns itself from an illegal practice by definition into one part of the institutional stabilization mechanisms, or one of the possible marking devices for social institutions when they move away from constitutional legitimation. Of course, disobedience definition in Rawls counts exclusively in the case of a democratic society justifiably founded, in which some heavy violation of the law happens anyhow. Therefore disobedience would appear appropriate and theoretically possible only in a nearly-just regime. Next, and beyond this concept of a liberal mould that “states a disobedience to the law” but inside “its loyalty”, with the crisis of Modernity and Fordism a new radical conception would be raised that would have changed civil disobedience’s nature in social disobedience. A form of disobedience, the last one, that cannot reduce itself to the normative techno-juridical aspects to be understood. Since power, to agree with Foucault, is not exclusively based on juridical-institutional models such as the State or sovereignty theory, social disobedience now focuses on power mechanisms that are not subjects of decision – on specific ways with which power anonymously penetrates the body of the society, beyond the veil of formal rules. If a condition of civil disobedience is the recognition of a higher organization that makes rules and as such is not called into question, then this role of submission to sovereignty or to a transcendent entity is no more guaranteed by social disobedience’s manners. The first order to be violated by social disobedience is actually a norm that precedes all the others, and it is assumed by the other norms. Nobody doubts this unwritten norm, it asserts the obligation of obedience as such. It claims that: “It is necessary to obey the laws” as supposed by authority as the right to command and to be obeyed. Social disobedience does not violate the law but modifies the conditions in which state restriction keeps setting itself . With the advent of post-Fordism the socio-economical background and the proposal of an antagonistic practice change. The rules or principles that preside over disobedience norms are no longer negative; they do not any longer show the limits that our acts must not cross, but begin to enunciate action principles. They show what to do. They do not only declare rights, refusal and resistance; they immediately become fruitful and creative. They become “constitutive practices” in the meaning given by Toni Negri. In this sense social disobedience today is a moment of contemporary production of a multitude or, better, of new political subjectivities. In particular disobedience can today conjugate work, intellect, reason and communication. Its autonomous and affirmative expression therefore explicates itself in the model-making of a new image, in the ability of intervention on the symbolic level, in the power of production of new marks and other representations. So disobedience does not mean merely breaking the law; defection also seeks to involve the productive potential of images and communication. In other words, when we disobey we have to realize an alternative practice. We have to imagine new words, new times, new spaces and to create a displacement of the boundaries that hegemonic power produces. So we need imagination, language and many others faculties that usually belong to artistic practices . But there is one more important reason behind such interpretation of the term Disobedience and it is closely linked to the Post-Fordist conditions of production and a specific anthropological dimension. ‘The work process based on knowledge and linguistic communication, just as the forms of life subjected to perpetual innovation, presuppose the capacity to move from well-defined rules to bio-anthropological regularities and then from these to those.’In such an environment, both obedience and the application of the civil rules typical of traditional social education no longer provide any effective protection from the implicit risks of disorientation and indetermination in post-Fordist societies. On the contrary, it is precisely ‘disobedience’ that becomes the paradigm of the contemporary subject’s political and social activity. In fact, now more than ever, if it could be said, according to the refrain of the educationalist Paulo Freire, that humans are not beings of pure ‘doing’ but are always beings of ‘what to do’. Then the current historic-social conditions require this regime with flexibility and uncertainty as fundamental parameters. For us today, indeterminate potential is not a gap, but in a post-Fordist society it becomes a virtue of production. On the one hand, culture renounces building ‘protective pseudo-environments or stable social spaces in which behavioral repetition predominates’ the stereotype and the defined norm. On the other hand, current historic conditions place the greatest economic and social emphasis ‘on disorientation and non-specialization’ which are no longer, as in the past, held at bay or attenuated by social or cultural devices but are exhibited and valorized. ‘Neoteny’, as chronic infancy and uninterrupted education on the one hand, and production sector on the other, are examples of distinctive and complementary growth regimes, both required and encouraged by the same post-Fordist society. This does not mean that work loses its centrality but that, on the contrary, with the crumbling of the boundaries between work and non-work, the latter increasingly coincides with ‘the time of life’ itself. The need for continuous learning is the counter-logic to the progressive and constitutional deterioration of stable, safe and unambiguous ‘environments’ capable of guaranteeing habits, rules, institutions and consistent elements. In this sense, disobedience is not only (and not so much) opposition to repetitive norms or unambiguous rules that, by now, have no validation in the absence of any determinate ‘environment’. Disobedience is then not the deliberate violation of the law, not even merely as a social context of opposition. Rather, it is an autonomous process of creating alternative subjectivities and of independent, innovative organization, which are no more than the same requisites on which current production activities are based. So in conclusion we can quote the title of recent book by James Scott and we can assume Disobedience as “the Art of not being governed”. These reflections have given rise to this project of an ongoing archive dealing with forms of civil disobedience structured around a video library that acts as an area of visibility and a field of legibility. That which normally would be conserved in a judicial archive is here the fundamental material for an archive of ideas. The goal of the Disobedience archive is to create a common space for artistic output and political action, understanding that society itself is changing and with it the language it produces as a political subject and as a media object. What is the image of a protest movement? What is it’s relation with those produced by corporate media? What is the difference with the corporate media’s manner of production? How a protest is represented? How constituent images are produced? How does a movement visualize itself? Which forms of self-representation can we produce? Shall Disobedience be only the content of these images or has it to involve also the way in which an image is produced? In which way can we disobey to a production process of images? So the main focus of the archive is not only on how the protest is represented or how we can create a counterpoint to the mainstream news media, but the idea of self-representation, because what is at stake here is – in which way molecular and alternative practices can represent themselves, taking the idea of Guy Debord – to unite what is separated through the construction of situations as a starting point. But the best answers to these inquiries can be taken directly from some samples of the Disobedience video collection. So I would like to show you some examples …..
1) Copenhagen Free University in which they want to represent 10 years of their activity, relating to an idea of alternative educational practice. Since during their activity they have always refused to take on any stable identity over time, their film is also a sort of an iconoclastic gesture, where no image appears, except that of the dust from their spaces. A sort of homage to the film by G. Debord, Hurlements en faveur de Sade (1952). Practically speaking, the Archive for the moment consists of ten provisional sections. They document temporary organizations and events, reclamation projects, independent media networks, collective platforms for cultural production, urban tactics, communication tools for creative resistance, plural elaboration, parallel planning, direct action, counter information and biological resistance. These are open, self-managed and performative spaces. Many of these phenomena are associated with ‘tactical media’, which was born out of the DIY philosophy that spread with the ‘electronic revolution’ that made a lot of technology devices accessible – from low cost video recording tools to free access to the web – to groups or individuals (hackers, interventionists, culture jammers, etc. ); groups that felt they’d been damaged by the mainstream culture. Using a diverse range of methodologies these groups and projects address some of the most fundamental and urgent challenges of contemporary urban life. “Just as labour was the form of exploitation and ‘surveillance’ of the ‘general subjectivity’ in capitalism prior to 1968,” says Maurizio Lazzarato, “communication, language, and information as well have become the standard forms of exploitation and control of subjectivity in post-1968 capitalism.” And, as the theoreticians of immaterial work explain, while the continuity of factory discipline was felt in a contractually defined part of life, the indirect control of today covers the entire life of the independent worker. This means that is no longer “work time” that the information economy captures and makes productive, for it is all the time of life that is affected. This means it is no longer possible to speculate about an area outside capitalist relations or to postulate one that is external to the market economy as there used to be in the previous Fordist production cycle. So while it is true that, in the present capitalist regime, any discussion about power cannot exclude an analysis of language and images (quite apart from particular classes of affiliation), it is also true that an understanding of visual culture becomes heuristically effective only if we are able to transform it into a sort of criticism of the political economy of images. Benjamin was well aware that the act of responding to the commoditization of images or to the rules governing perception by reasserting art – as a moment of time liberated and thus subtracted from the market – would simply be reactionary. But most of these problems derive from the movement of Autonomia active in Italy from 1968 till 1978. This section focuses on revolutionary politics in Italy in the 1970s, especially 1977, the year the movement climaxed in large-scale violent confrontations with a reactionary and authoritarian state. The videos here were political tools in the students’ and workers’ struggles that define that crucial year. The section includes works by Italian underground cinema pioneer Alberto Grifi (1938-2007, Rome), the independent video collective Dodo Brothers (active in 1977, Bologna), a recent videointerview with Oreste Scalzone by Paola Salerno, video documentation of the work of Laboratorio di Comunicazione Militante who were exploring the image and its strumentalization by the mainstream media and a film collaboration between Italian artists Gianfranco Baruchello and Alberto Grifi. Key episodes in and around 1977 were featured in the videos and the accompanying timeline of the key events: the Parco Lambro Festival in June 1976, the police raid on Alice Radio and the Congress against the repression in Bologna etc. Yet some other video works, such as slideshow by Laboratorio di Comunicazione Militante, Normalina movie by Grifi and a film About the Flies by Baruchello and Grifi deals with the consequences that lead to the multiple arrests and interruption of the course by which the Autonomia movement was advancing. The roots of the contemporary multitude can be traced back to the post-Workerist radical left in Italy in 1977, whose heterogeneous protagonists were no longer limited to factory workers. As Italian theoretician Franco ‘Bifo’ Berardi writes: ‘The 1977 movement in its expressive forms and in its political intuitions seems to be current in the behavioral strategies of the movement after Seattle, and more generally, in the behaviors of political and existential independence in the living cultures (I can no longer use the word alternative) of our times. How come? From my perspective, the answer lies in the two-sided, ambivalent nature of the 1977 movement, which is partly influenced – especially in its awareness – by the history of the workers’ and communist revolution of the 20th century. On the other hand (and perhaps in the more vibrant, deeper and less superficially sensitive part), it is an anticipation of the social and anthropological crisis of the forms of modernity and perhaps of the forms of humanity.’ (Berardi, excerpted from Disobedience and Cognitariat, a conversation with Marco Scotini, 2005). So, exactly Italy in 1977 is the territory where we can find the roots of what is called the contemporary ‘Multitude’, the idea of a post-Fordist society and today’s idea of disobedience as political action in a post-political society. It is also the source of the complete re-articulation of the relationship between art and politics that we find today. Other sections of the Archive include: BIORESISTANCE AND SOCIETY OF CONTROL, ARGENTINA FABRICA SOCIAL, PROTESTING CAPITALIST GLOBALIZATION, RECLAIM THE STREET, DISOBEDIENCE EAST and others that vary from context where the Archive is exhibited. After the first exhibition in Berlin where artists took care of the display themselves, I have tried to invite one artist or an artist group to think of a concept of display and mediation of this material within different exhibition spaces. WHY IS DISOBEDIENCE AN ARCHIVE? In a publication “Digital Resistance. Exploration in Tactical Media” from 2001, the American collective Critical Art Ensemble writes: “Tactical media is ephemeral. It leaves few material traces. As the action comes to an end, what is left is primarily living memory. Unfortunately as feminist performance theorist Rebecca Schneider has convincingly pointed out, no one has solved the haunting problem of the archive”. So if we talk about Disobedience, the archive seems the model most able to accommodate an interwoven and widespread multiplicity that has open links of variable duration. The archive model as such is always an a posteriori construction determined by pre-existing formations and groupings that become connected by means of a configuration, a style or a selection, and by doing so establish themselves in the memory. Each of the artistic interventions I have included in the archive is like a document, the proof or a certificate of an event. I believe the archive has the most to offer. It is said that what becomes history is determined by what is archived; since what we are dealing with here are ephemeral events, which lie outside mainstream art and history, it is very likely that conventional historiographic methodologies will confine them to oblivion. It is, in fact, the meaning of ‘archive’ as developed by Michel Foucault in his ‘Archaeology of Knowledge’, and commented a number of times by Gilles Deleuze, that seems to me the most pertinent. Here the archive presents itself as an area interposed between tradition (style, library, ‘langue’) and the single work (‘parole’, and author). It is located at the level of a discursive system external to our language, in a place where the production of discourse is simultaneously controlled, selected and, in the end, dominated. The archive, says Foucault, ‘is first the law of what can be said, the system that governs the appearance’ of the enunciation. But what are the enunciations? The enunciation is language in the moment of its apparition. It is a function not an element. In the archive nothing is asked of the things said or from the people who have said those things but from the discursive space, that is the possibility or impossibility of enunciation. The question is how do discourses function? In our case, if civil or social disobedience becomes a condition of political action in the post-political era, how does it function? The Foucauldian archive is made up of heterogeneous elements in which one seeks discontinuity and superimposition. It clarifies, however, the specific constants that permits the regime of language to be grasped, the knowledge that the archive exists in its stratification. It does not interpret the document, nor does it ask it to show signs of anything, instead it elaborates, distributes and organizes it, establishing series, or series of series. In the case of Disobedience this model of an archive becomes important precisely because it does not present itself so much as a collection of signs to be conserved and interpreted but as a collection of practices that form the actual goals they speak about or represent. How can the immediacy and unique nature of an event be recorded? How can such events manifest themselves and link up to others? How can they be confronted and defined? What knowledge do they contain? How can an archive be displayed? How can it be used by the public? The Disobedience archive is only a container – one that is simultaneously practical, physical and theoretical. Deleuze would have described such an archive as a tool-box that is there to be used. What interests me is the immanent order of the archive, the fact that its order can be changed. And it is for this reason that I tend to collaborate with different artists in order to devise the display system for each presentation of Disobedience. They all are dealing with the practices of cultural mediation, encyclopedia, exhibition design (Eric Beltran, Luca Frei, Zbynek Baladran, Xabier Sallaberia). The last but not least thing that we can say about the Archive, is connected with the way through which heterogeneous material can be edited in a different way every time, trying to find a possible articulation that can give political significance to the different events. So behind the idea of the archive there is the idea of the network and a patchwork. So the questions are: In relation to what is a temporary political concatenation organized? In which way we can create a sort of connection, association or assemblage of one element to the next between different fluxes, speeds and different coalitions or associations? Because we can create an additional concatenation or an oppositional one. Regarding this point I would like to reconnect this idea of a temporary network into a physical display to the idea that Hito Steyerl formulated in the text The Articulation of Protest and that recently has been revisited by Simon Sheikh in 2011. She tried to investigate and to confront two terms- articulation and montage, the first taken from the political theory and the second from filmmaking and art field. What they analyze is at the level of the sequence of images in video documentation or video representation, instead here it is put on a level of display. What disobedience tries to find is the articulation of the materials of an exhibition as a form of a protest (manifestation) and in the end as a tool for political and social re-composition. It aims to become a theoretical anticipation of a possible ground of this political re-composition: the only force able to contrast the dynamics of the contemporary capitalism. Welcome to Networked Cultures and Participatory Media WordPress Blog! Please use this WordPress page to post your comments on lectures, meetings, project ideas or anything else that you find relevant for the 4.330 class.